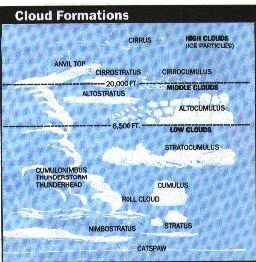 Flat clouds (or stratus -- little vertical development) are normally associated with stable air. Puffy clouds (or cumulus - considerable vertical development) indicate unstable air. The greater the vertical development of the cloud, the greater the instability. Thunderstorm clouds have the greatest vertical development and the associated weather is quite violent.